Crochet history dates back as early as the 1500s with origins from the Mediterranean places. It’s an established craft so that even though there have been many innovations, most techniques and patterns are derived from the vintage works. In fact, most antique patterns can be given a modern look and are still as practicable for today’s use. Crocheting is intricate handiwork. It’s one of the few art forms left that you can do at your own leisurely pace. One writer has even called it the perfect accompaniment to daydreaming. It requires slow and gentle strokes to do crocheting so you can never hurry to finish a project. Many enthusiasts say that if you’re stressed about something while you’re crocheting, that stress will show in your work. With all the different selection of hooks, yarns, stitches and techniques to become familiar with, it is easy for any beginner to get overwhelmed and discouraged. 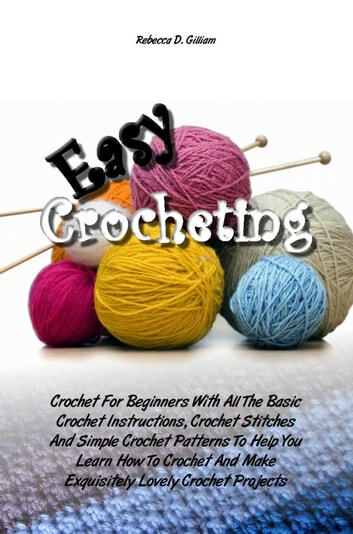 But any craft form requires some amount of know-how and skill, and so any beginner must possess the enthusiasm, patience and dedication to learn and master all the crocheting techniques. If you’re really into crochet and want to be successful with your projects, don’t be discouraged by your first attempts. The more you work on your mistakes, the better your skills will be. Crocheting is like tennis: the more you hit the ball “over” the court, the better your shots will be. So start learning the basic techniques and then practice, practice and practice until you can hook, loop and shape with ease and make exquisitely lovely crochet projects impeccably! There are no illustrations of stitches, only a couple of patterns, and most of the book is story, not instructions.